Rob Bell is the founding pastor of the Mars Hill Bible Church in Grand Rapids, Michigan. His most recent book, Drops Like Stars: A Few Thoughts on Creativity and Suffering released in August. A graduate of Wheaton College and Fuller Theological Seminary, he is one of the most popular preachers in America. Perhaps he is best known for the provocative and creative work he does with video storytelling. Called NOOMA (the phonetic spelling of the Greek word for breath), the videos are staples in churches around the world. In San Diego for the National Pastors Conference, he met with YouthWorker Journal to explore issues in youth ministry. YouthWorker Journal: What are some specific tools youth pastors need for effective ministry? Back in my day, if you could play guitar (you needed to know chords C, F and G, but not much more) and could lead kids in wacky games, you pretty much got the job. If you could provide an insight into a Bible verse at the end of some activity, well then, you were gold. What are the magic bullets for today's youth minister? 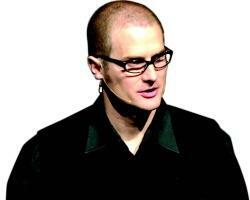 Rob Bell: I don't begin to think about that by wondering, "How do you do youth ministry?" I begin with, "What kind of person are you?" Let's explore your own experience with the resurrected Christ. So if a youth pastor says, "How do I create a safe place where my kids can deal with their pain?" Let's first talk about your own parents' divorce. Let's talk about how Christ is helping put you back together. A lot of times we've been burned because even if someone could play the guitar and got the job, then it turned out the person had a lot of other stuff he or she was carrying. Who doesn't have some story of a person they respected having a massive collapse spiritually, emotionally, sexually, whatever? YWJ: OK, the magic bullets, if you don't mind. RB: The dominant paradigm in churches is production, not discipleship. It's about how to keep kids coming—how are the numbers? In the gospels, whenever there were large crowds, Jesus gave a difficult teaching that thinned out the crowd. Over and over, He chose those moments: John 6—Unless you eat my flesh and drink my blood. Nice. Very accessible for kids. There is a certain pattern where He's trying to find out who is serious. Youth workers are put in this position where their paychecks are based on how many people they can keep in the place. When they read the gospels, they realize this whole system seems to be going the other direction. Many youth pastors I've met are promoting something they don't believe. RB: They're told by the senior pastor to encourage the students to attend the service where there's a seven-part sermon on raising funds for a giant building, and kids don't really buy it. At the same time, the kids are wearing a red bracelet and becoming passionate about AIDS and water in Darfur. So the youth pastors and the kids sit in a system that says the preservation of this system is the first priority, and they look around at these giant issues of justice that are demanding a generation to step up and do something about it; and guess what they do? YWJ: So the key to effective youth ministry is to understand the youth pastor is living in two worlds that contradict one another? RB: The problem for a youth pastor is that he or she has these gut impulses and can't even articulate them, especially theologically or biblically; so the person is in this awkward place of not being able to say this in staff meeting because he or she doesn't have pie charts and PowerPoint slides for it—just an intuitive sense that these kids are resonating with things and that we ought to be listening to these impulses; but they don't fit into the paradigm. So, I would say the first thing youth pastors need is courage—courage to be holy men and women. YWJ: Could we get back to the professionalism part of youth ministry and how to get thousands of kids to come to our youth programs? RB: I work from a different assumption. My assumption is that the real issues are about the interiors and not the exteriors. What the past couple of hundred years have done, with the invention of machines and mechanisms where you push a button pull a lever, is that it created metaphors of production and industry that are applied to matters of the spirit. So in youth ministry, we ask: How do you grow a youth ministry? How do you reach kids? What external techniques, skills and strategies do I need for doing A and B so I can get to C? The real issues are first and foremost about your own interiors, your own following of Jesus, the way in which the Spirit of God is healing you of all sorts of things. The ways in which you are experiencing the resurrected Christ in a thousand different places. YWJ: Why do so many youth pastors start strong and then burn out? RB: This goes back to a production understanding versus discipleship. When Jesus dealt with crowds, He would then withdraw to a lonely place and pray. As the crowds increased, His rhythm of engagement and disengagement seemed to increase. In our culture, the larger the crowds, the harder you gotta work. When you move from a production model to discipleship, one of the questions becomes: Is this sustainable? Am I leading the kind of life in which I'm experiencing and living the things I'm inviting others to experience? YWJ: What would that kind of disengagement look like today? RB: Well, experiencing Sabbath is one example. It's a lost art. There is a reason why these ancient disciplines are absolutely necessary. Just ask your average youth pastor, "What day of the week do you not answer your cell phone and not answer email?" When they say, "What do you mean?" Then I say, "Call me in four years when you burn out." Rabbi Heschel said that Sabbath gives the world the spiritual energy it needs to exist for another six days. There is something very mystical and practical about disciplines such as the Sabbath and about centering prayer. These all clash with the gods of production. YWJ: How do you personally keep from buying into those gods of production? RB: I have very strong boundaries. There are thousands of things I don't do. My wife and I are ruthless about sustainability. I would tend to just go all the time, so this has been a bit of the journey for me. Saturday is the Sabbath, and I make the boys breakfast and pack their lunches, and we have dinner together every night. I haven't done a pastors' conference in years. God is down in the valley, as well as on the mountaintop; and actually the valley is where we live. This idea that God is to be found up there, well, to me, God is found in making lunches for your kids, driving them to school and helping them with homework; making pasta and taking the dog in the woods with us. YWJ: So, celebrating the Sabbath is a tool for ministry? RB: If you're busy, fried and a wreck, who wants your gospel? YWJ: A lot of people in youth ministry have traded in their guitars for video cameras, no doubt influenced in part by the videos you have done. Is the ability to make a great video the new "it" skill for youth ministers? RB: (grabs microphone and nearly inserts it in his mouth) Making great videos and short films is totally overrated. (Dries off microphone and sets it down, laughing.) Shane Hipps has a new book out called Flickering Pixels, and he describes the ways youth pastors get suckered into using new tools and how those tools shape us. When you put a message on film, for instance, it's now not that message; it's a new message. Because the very form you put something in—the medium is part of the message. Hipps takes you through the media analysis of how the medium forms the message. YWJ: What about the Nooma videos that you do? RB: Once you see the Noomas, you think you know me; but we don't know each other. We've never met. Film gives you a false sense of intimacy. Hopefully, wonderful truth can be communicated; people can be moved; they will wrestle with substantive issues; but there are other things going on of which we need to be aware. YWJ: It spreads the message, though. RB: But there are consequences, and they need to be counted. YWJ: You're big on mystery, wonder and mysticism. Can that work in youth ministry? Will kids stay on track if you go there? RB: They're much more in tune. It's when you get older that you believe you can figure all this out. I think a kid fundamentally understands there's a God who made everything, something is happening and history is headed somewhere; and they understand that it's awe-inspiring and amazing. They would be OK with language failing. YWJ: Aren't they looking for answers? At least in school there are answers. RB: I was bored out of my mind in school: Here's the answer, OK. What's the next answer? OK, I got it. Then they meet somebody who's awe-inspiring, such as Bishop Tutu. They resonate with that. YWJ: So youth workers shouldn't see this mystery as troublesome? RB: It's a reality, so embrace it and celebrate it. N.T. Wright tells his students that a third of what he tells them isn't true, but he doesn't know which third. YWJ: What books have shaped you? RB: That's a long list: Divine Conspiracy by Dallas Willard; a Swedish explorer rode his bike from Sweden to Mt. Everest and home, without using supplemental oxygen—everything he needed he carried on his bike and he wrote about it in the book Ultimate High; Everything Belongs by Richard Rohr; a lot of Catholic works; A Holy Longing—I was deeply, deeply shaped by that book. YWJ: What drives you, inspires you in the work you do as a pastor, father, writer? RB: I stumbled into a life that I find really joyful. I've always been compelled by Jesus. I've always found Jesus fascinating. Everybody has a rule of life. I just find in the Resurrected Christ an order and a rule of life that is worth dying for. I pray a lot, rest a lot and read a lot. Josh Seligman is a journalism student, Point Loma Nazarene Univesity, San Diego; Dean Nelson directs the journalism program at PLNU and authored God Hides in Plain Sight.